Looking for Package Deals to Edinburgh & East Lothian? We have those too! Edinburgh, the capital city of Scotland, reflects the history, culture and personality of the nation. From the first view of the Castle - with its dramatic tales of siege, warfare and dark deeds - to the bohemian restaurants and bars of the port of Leith, Edinburgh represents the essence of Scotland, its history and its modern day nationhood. Further out from the city, Edinburgh is bordered by the seawaters of the Firth of Forth to the north, and the Pentland Hills in the south, while to the east and west lie the Lothians: an area with many interesting towns, a fine coastline and attractive countryside. Places of great historical importance include the remains of Linlithgow Palace, the birthplace of Mary Queen of Scots. Scottish hospitality at its best, The Lodge at Craigielaw is the ideal base for exploring "Scotland's Golf Coast" and the beautiful East Lothian coastline with its stunning beaches and golf courses. Boasting a t25 modern amenity en-suite rooms in a traditional Scottish setting, guests can choose Sea View or Courtyard View accommodations. With the scenic 18 hole Craigielaw Golf Links championship course on site, plus 15 of Scotland's greatest courses within 25 minute drive, Craigielaw is truly a golfers paradise. Dine in the Craigielaw restaurant or lounge which offer the finest locally and seasonally produced food alongside an extensive range of whiskies, wine and beer. Archerfield is a magnificant haven encompassing over 500 acres along Scotland's Golf Coast of East Lothan and the Firth of Forth. 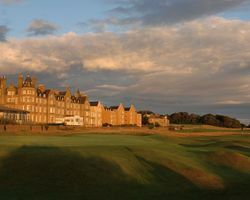 Golfers can choose among a variety of exceptional accommodations at Archerfield, from the historic to the contemporary. Whether it's two or or a group of 60+ golfers, you'll find the perfect place to stay for your Scottish trip! Archerfield Pavilion Suites Located beside the Mansion House, the Archerfield Estate Pavilion Suites consist of 12 en-suites and are available for one golfer or a large group. These private Suites allows guests to stretch out and relax after a day on the links thanks to a generous sitting area and large en-suite bathroom. Each morning of golfers stay at the Pavilion Suites, a fabulous breakfast with all the trimmings is included for all guests and served in the Archerfield Clubhouse. Archerfield Lodges Enjoy an experience deep in luxury in Archerfield Lodges - complete with roaring open log fireplaces and stunning views of the Archerfield golf courses. The nine lodges have either 3 or 4 bedrooms, open plan living/dining areas with natural wood designs, plus modern/classic furnishings. Each of the Lodges have cable TV and WiFi and are equipped with a full kitchens with everything needed to cook all your meals if you choose. Chef hire is also available. Archerfield Lodges feature wide open balcony with great views for guest relaxation and unwind after a day on the golf course. Archerfield Cottage With sea views from every room, the Cottage is an exclusive stay, quiet retreat with private access to the beach. The two Cottage bedrooms can accomodate up to four guests with rooms set as a single, twin or double. Each morning of golfers stay at the Cottage, breakfast is included and prepared at the Cottage, or guests can enjoy a fabulous breakfast with all the trimmings served in the Archerfield Clubhouse. Cottage guests can also help themselves to a small stocked larder with soft drinks and snacks. Archerfield Marine Villa The Villa is aptly named due to the scenic views across the Firth of Forth and just steps from the beach via guests own private access. Marine Villa is and exclusive stay accommodation for a more private location for up to 10 guests with four en-suite rooms and two single rooms with shared bath. Guests can prepare own meals in the fully fitted kitchen, or Chef hire will be in house to cook up planned meals for Marine Villa guests during stay. Each morning of golfers stay at Marina Villa, breakfast is included and prepared at the Villa, or guests can enjoy a fabulous breakfast with all the trimmings served in the Archerfield Clubhouse. Cottage guests can also help themselves to a small stocked larder with soft drinks and snacks. 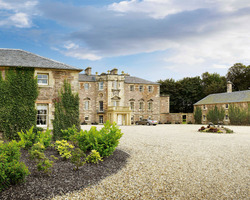 Archerfield House The heart of Archerfield Estate is the magnificant 17th century Archerfield House - available for group exclusive use when staying in East Lothian. Exuding elegance and informatility, the Mansion house comprises 15 double en-suite bedrooms, plus the principal room, rotunda, snooker room and dining room. Exclusive use Archerfield House includes daily breakfast, 3-course dinner, afternoon tea and all soft beverages, beers, wines and spirits during stay. Each room has a fully-stocked larder which guests can raid during your stay. Groups staying in the Mansion HouseMagnificant and grande....the Archerfield House country retreat is where your group can unwind and relax! One of East Lothian's best-loved retreats, Duck's Inn is recognised as one of Scotland's Golf Coast leading hotels with gracious, traditional Scottish hospitality, distinctive atmosphere and food beyond compare. Duck's Inn is a perfect central location for enjoying great links golf, scenic walks or boat trips to the Bass Rock. 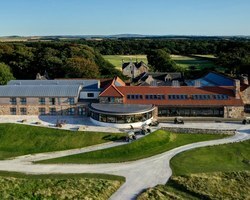 The Inn is located only 35 minutes from Edinburgh airport, plus there are nineteen courses within 15 minute drive of the Inn; ten have hosted championships and five courses have been qualifiers for The Open at Muirfield. 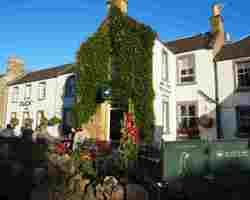 Built in 1638, the Inn's twenty-three cozy rooms set in the lovely East Lothian village of Aberlady, are a nicely appointed mix or single and double rooms with en-suite bathrooms. One of the more popular spots in Aberlady, The Duck's Bar is a tradional Scottish pub serving local Ales, a great collection of Malt Whiskies, wines and favorite cocktails. Patrons will enjoy the historical memorabilia left by golf legends or collected by Malcom Duck over the years, plus the legendary putting games that break-out! No need to venture for meals as guests can simply enjoy the five-star meals at John Paul's at Duck's - an award-winning restaurant serving traditional Scottish fare, plus the finest aged steaks, or seafood.